(Bloomberg) -- Nintendo Co. investors, battered by slower-than-anticipated sales of the Switch and a steep share decline last year, are starting to feel optimistic again. The possibility of price cuts for the machine, an improving software pipeline and the upcoming launch of Nintendo’s biggest mobile game in two years are all boosting confidence. That’s helped to fuel a 22 percent stock jump since a December low, following a peak-to-trough slump of 44 percent in 2018. Of the 22 analysts tracking the Kyoto-based company, 19 have given it a buy rating, at an average 12-month target price of 49,313 yen, according to data compiled by Bloomberg. That suggests a potential 46 percent return from Friday’s closing price of 33,850 yen. One key question is whether Nintendo will revise its forecasts when it reports results next week. Switch hardware sales during the quarter — which accounts for about half of annual revenue — are seen climbing 22 percent from a year earlier to 8.7 million units, according to the average of six estimates compiled by Bloomberg. Sales of holiday titles Let’s Go Pikachu/Eevee and Super Smash Bros. Ultimate could also help lift operating profit by 27 percent to 151 billion yen ($1.4 billion), according to the average projection. 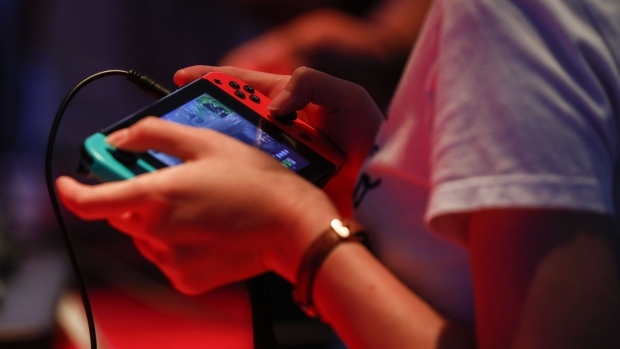 With Sony Corp. and Microsoft Corp. likely holding off on the release of their next-generation consoles for at least another year, Nintendo still has plenty of chances to attract more gamers, especially if it decides to cut the Switch’s $300 price tag or offers upgraded hardware.